Portlandia is a sculpture by Raymond Kaskey located above the entrance of the Portland Building, in downtown Portland, Oregon, at 1120 SW 5th Avenue. It is the second-largest Copper repoussé statue in the United States, after the Statue of Liberty. The statue is based on the design of the city seal. It depicts a woman dressed in classical clothes, holding a trident in the left hand and reaching down with the right hand. The statue is above street level, and faces a relatively narrow, tree-lined street. An accompanying plaque contains a poem by Portland resident Ronald Talney. Here's the our members favorite photos of "Sculptures in Portland". 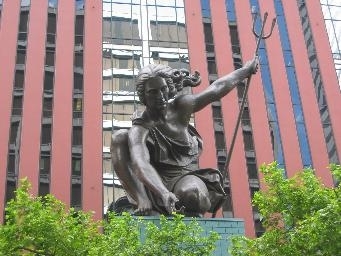 Upload your photo of Portlandia Statue!